Buried at HANOVER WAR CEMETERY, Germany. 14. C. 12. Aged 39. 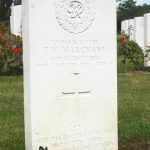 Son of George Robert Sutton Marchant and Elizabeth Marchant, of Brandon, Suffolk; husband of Hilda Marchant. 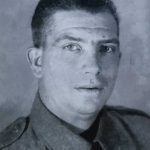 Ernest was born in the summer of 1906. According to the 1911 census his family – father George (27, furrier at a Brandon fur factory) mother Elizabeth (29, nee Wharf), Ernest (4) and Arthur (1); were living on Thetford Road, Brandon. According to the 1911 census the family were living in Thetford Road. Ernest’s father, George, was a Volunteer in the army before WW1, so when war was declared in 1914 he got his call up papers. George was killed in a raid on German lines in 1917 and his name is listed on Brandon’s war memorial. Ernest would have been 11 years old at the time. In the spring of 1930 Ernest married Hilda White. On 30th September 1939, Hilda passed away, aged 30, and is buried in Brandon’s cemetery.